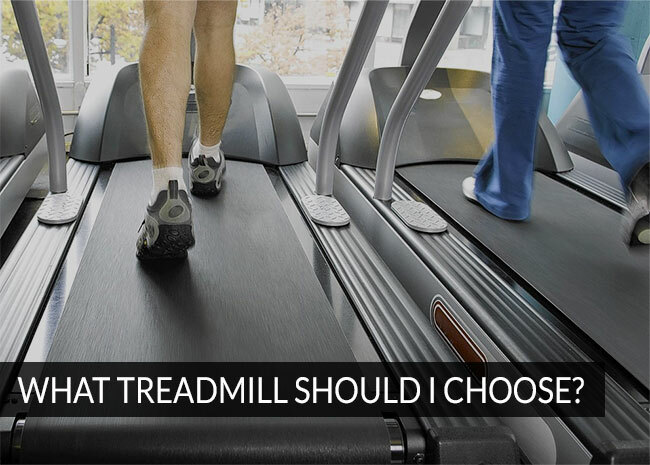 Gymkit UK News Blog - What treadmill do I choose? What treadmill do I choose? There is a lot to consider when buying a treadmill for home use. First of all setting a budget will help refine your search. Depending on the space you have available will also determine what type of treadmill you can accommodate. In an ideal world buying an older used commercial treadmill is far better than buying a shiny brand new home use treadmill. Commercial treadmills have been designed to run thousands of miles. Buying a used treadmill even if it has been pounded on in a busy gym will still have years and years of life left in it. The home use treadmills are built for moderate use and of course are really for the home, therefore the parts and the design do not have to be as strong and robust as a commercial treadmill. Commercial treadmills also feel a lot safer and smoother to run and walk on. You will find the board you run or walk on has a lot more spring and give compared to the home use treadmills. The only downside with a commercial treadmill is they are a lot heavier and can be nosier than the home use treadmills. As far as quality goes you can compare buying a treadmill to buying a car. When buying a 3 year old Mercedes to a brand new Corsa..nothing wrong with either option but as far as value for money and investing it into years of use it would be sensible to go for the Mercedes rather than the Corsa due to a higher spec, safety etc. Once you have decided on how much space and what your budget is…this will really decide if you buy an ex gym model or a home use treadmill you then have to decide what manufacturer you would like. In the gym world manufacturers such as Life Fitness, Precor, Technogym, Nautilus are some of the best manufacturer’s in the fitness world and actually you can buy one of these treadmills for all about the same price as each other. Brand new these treadmills cost approx. £10 000. A 3 year old treadmill can cost approx. £2000. You can guarantee buying any of these makes you will have the best treadmill for the money you are spending. If you are a member of a gym and have been using a particular manufacturer it makes sense to buy the same as what your gym use. Purely as you will be familiar with the programmes and how to operate the treadmill. Manufacturers like Precor also bring out different models. Some have heart rate sensors, some decline as well as incline, some have more programmes and can work with your heart rate. Before buying a treadmill have a think about what is important to you when using a treadmill. If you like to be in control of your own pace and incline you may not need a treadmill with various pre designed programmes. The same as if you don’t use a heart rate monitor you may not need this feature. Understanding what you actually need will also help you to spend your money wisely rather than paying for fancy extras that you will not use. The main reason we would recommend buying a used treadmill or any other cardio vascular machine over a brand new home use model is that your machine will definitely have a longer life span. The commercial machines are designed to have such a heavy use that once in your home you will be giving the commercial treadmill a real rest!!!! Most clubs refurbish their equipment every 3 years. There will be nothing wrong with the equipment meaning if you buy the right treadmill not only in your home but even if re installed into a club you can guarantee thousands and thousands of miles ahead.